Ok, Ok... now before you think I've lost it..(haha, I just crack myself up)those of you that follow my blog. There is a challenge at Tacky Tuesday's. The challenge is a play on words. The "tacky cut" for this was Whale from Create A Critter Cricut Cartridge. Now for the card that I made for this challenge. I hope you get as much of a laugh as I did. Shh! Psst!! I won't tell you my hubby thought I lost it when I showed him the card. Hahaha, he laughed and shook his head. Gotta love it!!! Now to show you the card. Drum roll please....no, no I'm only kidding...lol. OMGosh! What a cute/funny card! Great job on this weeks challenge! Thanks so much for playing along with us at the Tacky Tuesday challenge! Good Luck! I don't think you've lost it, Leah. 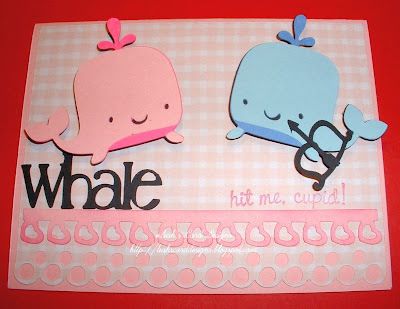 This is my kind of humor too, and I love the cute little whales. I almost literally fell off the bed laughing at your card! My dog, who was the only one present at the time, now knows I am certifiable, after suspecting it for years! It's just soooo tacky, it almost puts my flamingos to shame! You stopped by One By One The Flamingos Are Stealing My Sanity, and I promised a stop back with another way to win in my 500 Followers Celebration. Just go to my blog at http://karelj.blogspot.com and become a Nteworked Blog Follower. (If you are already one, leave me a comment saying so). That way, you'll be counted twice for an entry into my surprise give-away! Thanks for Following The Flamingos!